Ah, there's nothing quite like finishing a big pile of sewing! Such a lovely feeling of accomplishment. There are some pink cherry blossom trio brooches (already available in my shop, here), some white and peach brooches... and some cherry blossom headbands in both and pink and white/peach colourways. I made a few of the pink headbands last year, but with pale pink ribbons which I wasn't 100% happy with. 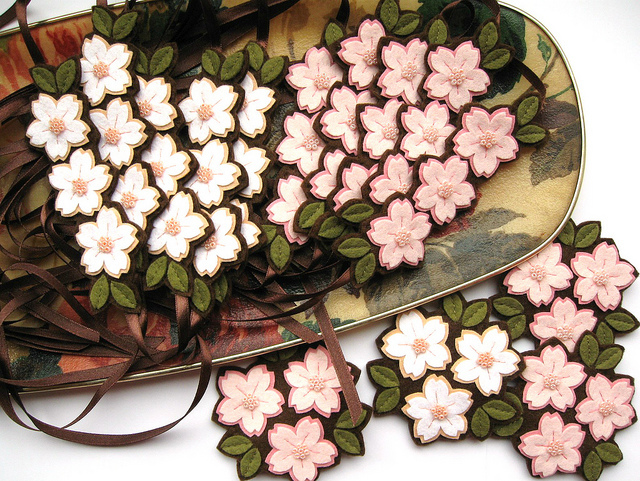 I decided to switch to brown ribbons instead (to match the felt the blossoms are sewn onto) and I'm very pleased with how they've turned out. Hopefully I'll get some time this week to take some product photos and get all these goodies added to my shop. I'll be sure to let you guys know when they've been listed! Your cherry blossoms are among my favorites! The design is so beautiful! Oh wow that's some work there! Oh my these are so beautiful - can't believe how much you manage to get done.